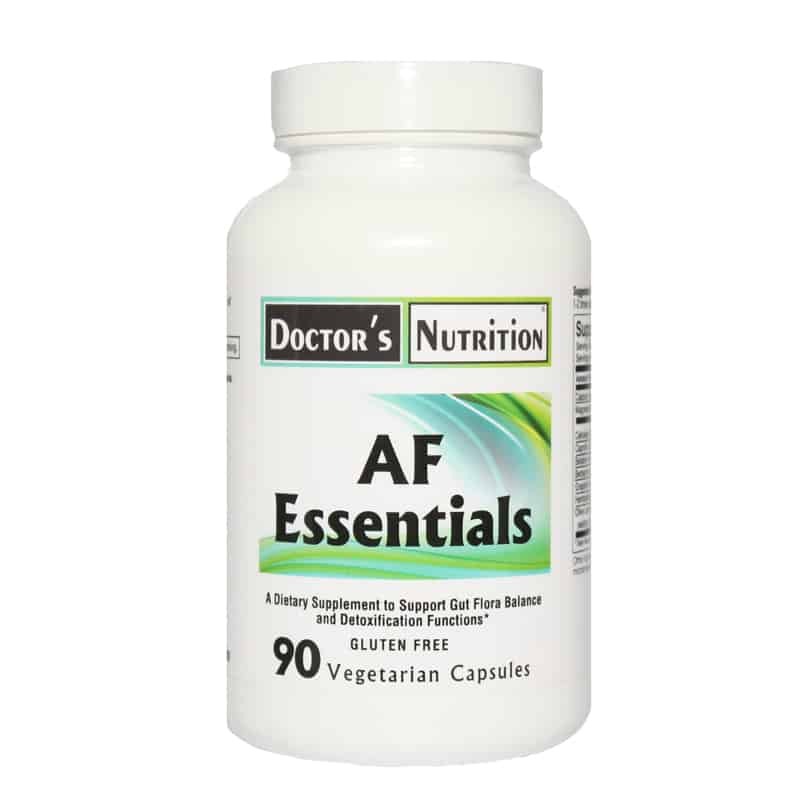 Recommended for restoring balance to the body during times of microflora imbalance/candida. Candida albicans is a naturally occurring yeast that is usually kept under control by beneficial bacteria (probiotics) like acidophilus. These bacteria, however, can be destroyed by birth control pills, antibiotics, steroids, cortisone drugs, chlorinated water, poor diet and extreme stress. When this occurs, candida can grow out of control and trigger low mood states, irritability, dizziness, difficulty focusing, extreme fatigue, loss of memory, gas, bloating, diarrhea, constipation and weight fluctuation. More than 100 million Americans are thought to suffer from candida overgrowth. About the Formula: Calcium Undecylenate helps to re-balance friendly flora and reduce an overabundance of Candida albicans yeast in the body. Olive Leaf Extract supports immune system function. It works directly against unwanted materials by stimulating protective cells (phagocytes) to ingest them without suppressing the immune system or damaging the body’s beneficial flora. Lavender Extract- helps to soothe the stomach and colon. Tea Tree Oil Extract and Red Thyme Extract support intestinal microbial balance. Betaine hydrochloride provides acid balance in the stomach. Low stomach acid interferes with digestion and the absorption of nutrients. Berberis vulgaris (Barberry) Extract inhibits the growth of many microorganisms, including fungi, protozoa, and bacteria. N-Acetyl Glucosamine (NAG) is necessary for glycoprotein synthesis. The glycoprotein layer of the digestive tract has a high content of NAG. * This layer is the protective barrier against stomach acids, pancreatic and stomach enzymes and bacteria. N-Acetyl Glucosamine improves the function and structure of the glycoprotein layer. 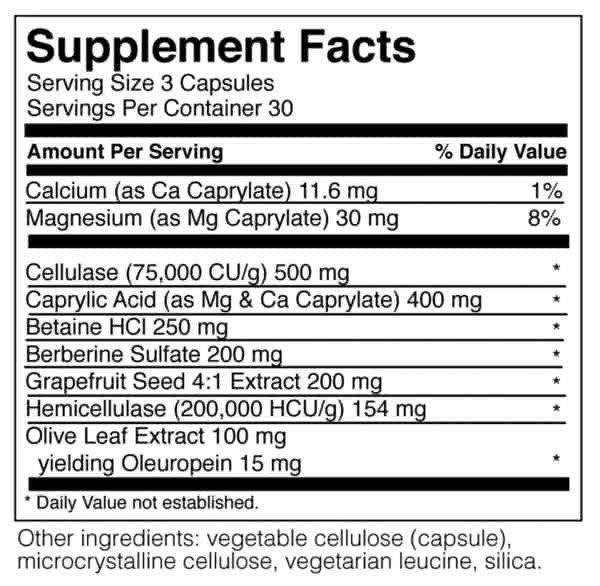 Grapefruit Seed Extract supports a healthy gastrointestinal system by helping maintain a healthy microbial balance. * Cellulase and Hemicellulase are fiber digesting enzymes that help to balance good and bad microflora. They can break down the cell wall of candida. Candida’s fibrous structures can be more quickly and completely digested without releasing any toxins. 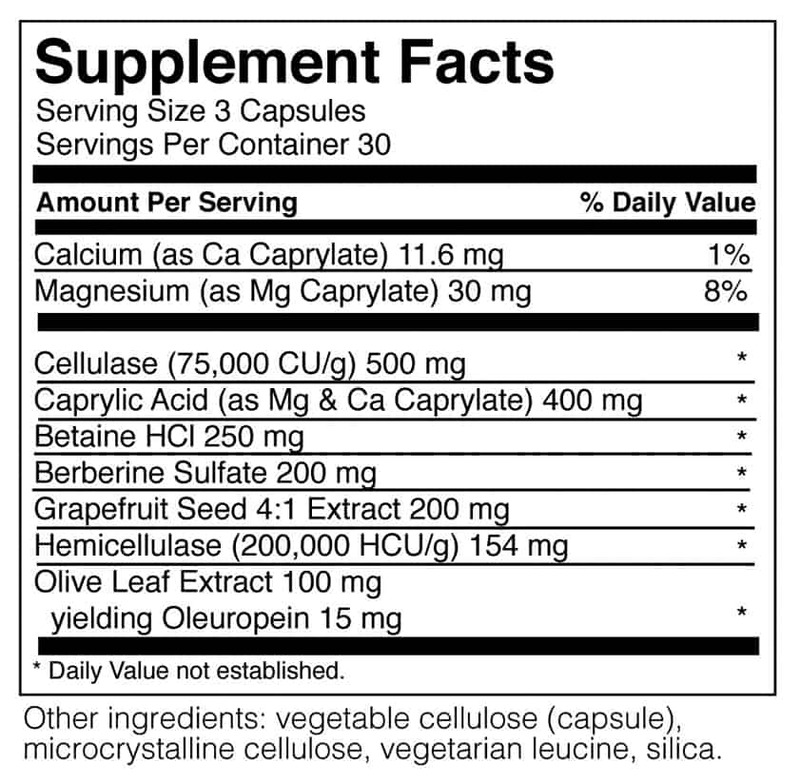 Suggested Use: As a dietary supplement take 3 capsules, 1-2 times daily, or as professionally directed.